Salesforce has committed to spend $US2 billion in Canada over the next few years, creating thousands of jobs. Fresh from his stirring speech on women’s rights at the Economic Forum in Davos, Switzerland, Canadian Prime Minister Justin Trudeau is touring the US. On Thursday, his trip took him to San Francisco to meet with various tech industry bigwigs, including SalesforceCEO Marc Benioff at the company’s new headquarters. 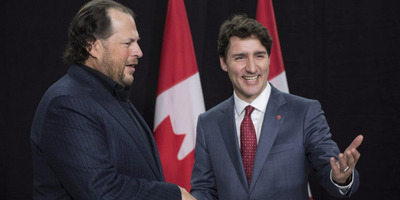 The overt reason for the meeting was to celebrate Salesforce’s commitment to invest $US2 billion in Canada over the next five years, building out its data centres and adding to its workforce there. Salesforce currently employs 1,300 people in Canada. While the company didn’t publicly commit to a specific number of new jobs, it quoted market research that calculated that its expansion in the country will lead to 28,000 new jobs and $US17 billion in new revenue in Canada by 2022, when calculating all things like contracts with Salesforce partners and tech bought by Salesforce customers. A couple of years ago, Benioff famously went to bat against several state laws that would allow business to refuse service to people based on sexual orientation under the umbrella of religious freedom. That included a showdown in Indiana over such a law, back when Vice President Mike Pence was that state’s governor. Trudeau is also known for being outspoken on women’s rights. His speech at the World Economic Forum last month discussed new Canadian legislation that mandated equal pay for women and advocated for “equal treatment” of women in the workplace.